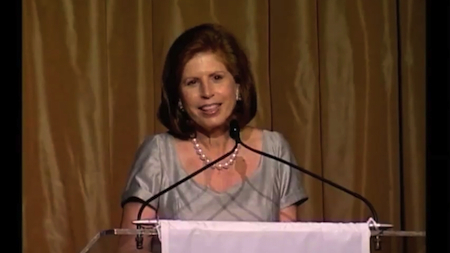 Abby Milstein spoke at the New York Legal Assistance Group’s (NYLAG) third annual dinner, held on May 22, 2013. The event honored New York State’s Chief Judge Jonathan Lippman and Bridget M. Healy, Executive Vice President and Chief Legal Officer of ING U.S. Nearly 500 people attended the benefit, which raised over $1 million to support NYLAG’s mission of providing high-quality, free civil legal services to low-income New Yorkers who cannot afford attorneys. The theme of this year’s dinner was “Rebuilding After Superstorm Sandy,” highlighting NYLAG’s Storm Response Unit, which is today the leading legal services provider helping affected New Yorkers navigate a complex web of government benefits and insurance claims in order to fully rebuild their lives. The dinner program, hosted by award-winning journalist Jane Hanson, included the premiere of a new video about NYLAG’s storm response work. In her remarks introducing the honorees, Abby Milstein described ING U.S. Chief Legal Officer Bridget Healy as a “star exmplar of the role that corporations can play in furthering community responsibility and philanthropy,” and New York State Chief Judge Jonathan Lippman as “a true champion of access to justice for all.” Ms. Milstein thanked NYLAG President Yisroel Schumann for his efforts after Superstorm Sandy. She also recognized the law firms that provided office space for 10 weeks after the storm damaged NYLAG’s offices, as well as UJA-Federation and the Robin Hood Foundation, long-time supporters of NYLAG. As the recipient of the 2013 Corporate Leadership Award, Bridget Healy was recognized for her outstanding legal career and her commitment to philanthropy. In addition to oversight of the law, compliance and government affairs functions, she oversees ING U.S.’s Corporate Responsibility Department, fostering a culture of giving back, while and serving as a valued mentor and advisor to many people inside and outside the company. Founded in 1990, the New York Legal Assistance Group provides high quality, free civil legal services to low-income New Yorkers who cannot afford attorneys. NYLAG’s comprehensive range of services includes direct representation, case consultation, advocacy, community education, training, financial counseling, and impact litigation. 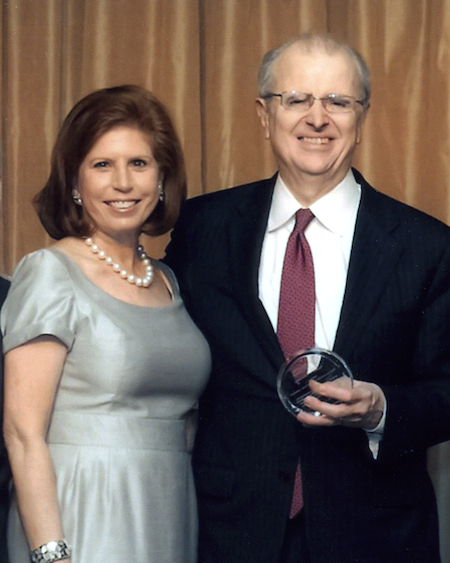 Abby Milstein, NYLAG chair, with New York State Chief Judge Jonathan Lippman, recipient of the 2013 Visionary of Justice Award, at the NYLAG 2013 Dinner.